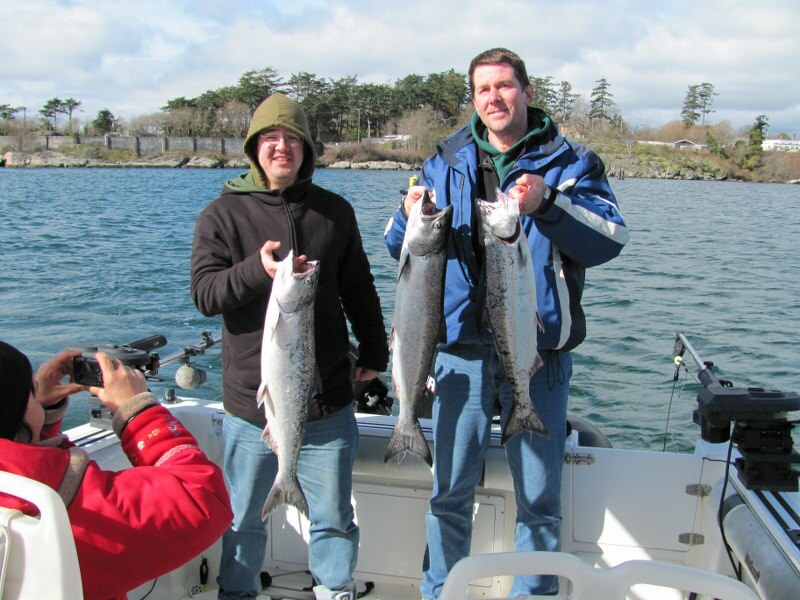 A few Spring Break fishing reports for the Sooke and Victoria areas. 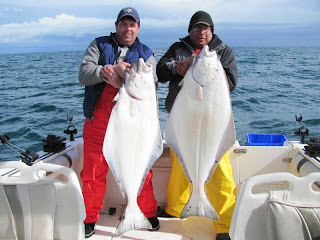 Though weather has been iffy, the halibut fishing has been excellent, and salmon fishing decent too. See the info below. Gord from Foghorn Fishing Charters reports: "The weather has been terrible, wind and more wind everyday so it has made it harder on fishing but there are good halibut and good salmon in the slot size around. Spoons and bait seemed to be the ticket for salmon last week and the ticket for halibut is herring and mackerel on the bottom, well away from any other boats -- more boats in a spot less chances of catching". Trevor from No Bananas Fishing Charters provides a good report as well "We managed to sneak out weds and thurs in between systems, to the Albert Head area. Weds we got the rods down at 930am and had our first fish a nice 50lbr in the boat by 1030, then all hell broke loose we just got cleaned up from the first fish when one of the rods slams down to the water and starts running line. My buddy Doug grabs the rod and I start bringing in the other 3 rods, once I got all the rods in I said 'how are you making out?' His reply was 'it's still running'. So I let go of our anchor and started chasing him down. Now I'm thinking '150 or 200lbs, wow 2 in 2 days', but about a half hour later I stick the harpoon in a tail hooked 85lbr. Still a nice fish and Doug's biggest by far but not what we were expecting. lol Then thurs we looked at the weather and figured we could get a couple hours in so off we went rods down by 1030 and rods up by 11 with a quick limit of 30lbrs. We caught fish on every bait from cutplug herring, mackeral, octopus, and grey cod bellies. It didn't seem to matter. The next set of good tides are Mar 24-31 get out there and get em!" Doug from D&D Fishing Charters reports from west of Sooke: "Saturday we Halibut fished Jordan River with two moms, and three 12 year olds. The water had a 1/2 foot chop and it was sun/cloudy. Fishing was great during the Ebb and we had four on and they landed two (not that easy for a 12 yr old) and the biggest as 47lb. Only caught one dogfish but I got four gray cod which I very rarely see in the Jordon River area. Salmon belly was the bait most fish hit on. During our trip back to Sooke we probably past 20 boats hali fishing". Get out there and catch some fish! Great February Fishing in Sooke!